It’s happened to all of us: You’re just trying to enjoy your meal in peace when a bunch of liberal hippies shows up waving signs saying “We don’t respect President Donald Trump” and chanting, “Green New Deal / Ban your meal!” And we’ve all long been hoping that someone would design an app that would allow us to eat in peace, or tell us where it’s okay to wear our MAGA hats, or whatever. 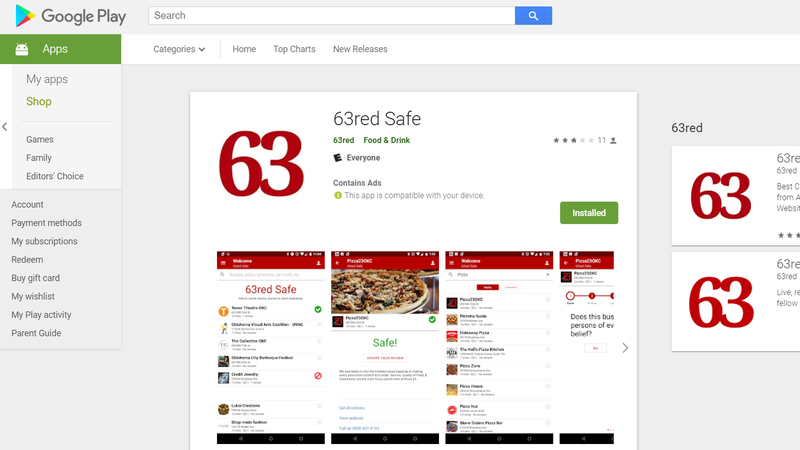 Enter 63red Safe, an app which the Daily Beast reports is like Yelp, except for determining whether a business will protect customers from roving squads of antifa supersoldiers or let them dine while packing heat. No, seriously, that’s pretty much what it does. The app (free on Google Play and Apple’s App Store) asks users to answer a handful of questions about local businesses, then marks it as either “safe” or “not safe” for conservatives based on the results. “I’m trying to position it as an everyday ‘where can I go eat safely’ app,” 63red founder Scott Wallace told the Beast. 63red Safe works like a conservative Yelp. Instead of reviewing the lighting and ambience, though, the site’s users rate restaurants and other businesses on a series of four questions, including whether the restaurant’s owners make political social media posts and whether they allow customers to carry weapons. … Wallace, who compares the app to a political “fire inspector,” is confident that the app will grow more popular as 2020 approaches. That’s when, he claims, more Trump supporters will be targeted by what he calls “socialist goon squads,” and businesses will become more interested in protecting their customers over their politics. According to the Beast, at least 5,000 reviews have been entered into the app by users. For example, several restaurants in the Oklahoma City region are listed as either “safe” or “not safe.” However, the app makes little effort to explain why, and it is additionally unclear how 63red Safe reaches its final determination based on the reviews. The Beast noted that in just a handful of instances, such as the Lexington, Virginia restaurant Red Hen, whose owner asked White House press secretary Sarah Huckabee Sanders and her family to leave last year, it’s clear that the review is based on some longstanding political grudge. Smart move for creating this app. Us Constitution and Republic supporters who believe in the freedom, respect, and peace for ALL need to finally stand up for ourselves and use our voices. The left are too loud, accuse us for any wrong action they actually commit, and demand we listen to them. We will not do what they want us to do, but we do listen. Let’s use this app and leave those on the left to their own demise. They refuse and cannot listen to facts and logic. Facts “trigger” them. Wanted to access the info on this app to determine where NOT to patronize. If they’re advertised here, we’re not going. And we’ll tell them why. Unfortunately, repeated attempts by Gizmodo to actually use the Android version of the 63red Safe failed, with the only function in the app, a search menu, hanging on a “Searching…” screen forever. The 63red website, which also serves as a Drudge Report-like aggregator of right-wing news sites, currently displays the text, “We’re sorry! Our 63red Safe app is experiencing heavy traffic right now, and may not load correctly. Please be patient while we work to correct this. Thank you!” We have since uninstalled it.